I’ve said it before and I’ll say it again – The Body Shop create decent and easy to wear perfumes at a phenomenally good price. They don’t perhaps approach the art of olfaction with as much gusto as their high street competitors Lush do, but they do know how to put together an enjoyable fragrance that doesn’t blow your socks off or your wallet up. In a world where many expensive perfumes aren’t all they’re cracked up to be, this is a refreshing quality to have. That said, The Body Shop doesn’t always get it right and their latest launch ‘English Dawn White Gardenia‘ is one such occasion (I’ve given the game away here, haven’t I?). Created to capture “the bouquet of hundreds of White Gardenia petals blowing gently in the first light of dawn”, this limited edition spring fragrance joins The Body Shop’s Voyage Fragrance Collection – a series of perfumes that take one on a whistle stop tour of the world via the medium of scent. Capturing the hedonistic scent of the gardenia is a pretty tricky feat, especially seeing as the flower itself is incredibly elusive when it comes to giving up its scent. Most fragrances that boast ‘gardenia’ as a note are reconstructions – olfactory jigsaw puzzles that piece together the flower’s most distinctive scent with a number of floral notes and crafty raw materials. Very few perfumes actually achieve the full gardenia effect (so far I’ve only come across Estée Lauder’s Private Collection Tuberose Gardenia and Arquiste’s Boutonnière No. 7 that manage it), so the big question is – does The Body Shop succeed in achieving gardenia photorealism? Well the short answer is ‘no’. English Dawn White Gardenia is not a gardenia per se, but it is a white floral that just so happens to be as bright and dawn-like as the description would hope. The perfume starts with fresh and lively top notes of blackcurrant and bergamot. Right from the outset it presents itself as a floral from the ‘Herbal Essences’ school of thought, meaning that it would feel more at home scenting a shampoo than it does as a wearable fragrance. As it settles, The Body Shop’s ode to the elusive gardenia flower becomes a creamy white floral with accents of green grass, dewy petals and sunshine. Like yesterday’s Miss Dior Blooming Bouquet, English Dawn White Gardenia boasts an ambiguous blend of flowers that is a little bit jasmine-like with hints of tuberose and lily of the valley. It also stays pretty fresh for the majority of its development and that creamy feel never really grows into anything delicious or enveloping and at times can come across as more than just a little bit thin. In the base, English Dawn White Gardenia relies quite heavily on a sturdy bed of musks that provide a radial effect allowing for a good degree of oomph to boost those creamy white flowers. There’s a touch of darkness hiding in the background too – a sort of subtle vetiver effect that gives the impression of petals and buds sniffed at close range. Like a lot of things within this fragrance, the darker aspects could have been explored further or accentuated to make for something altogether more textured and contrasting. If that were the case the whole thing would feel less ‘shampoo’ and more like a luxury product. For the price, English Dawn White Gardenia is an enjoyable floral and it would be fair to say that I would much rather encounter this one in the street than the majority of low priced celebrity fragrances or sticky fruit messes that seem to be incredibly popular at the moment. That said, I can’t get over the niggling voice in my head that says that a perfume with ‘gardenia’ in the title, really should smell like gardenia and the cheesy, mushroomy indole that makes this flower so wonderful is entirely AWOL in this scent. Perhaps if they called it ‘English Dawn White Flower’ I’d be more inclined to like it? Who knows! 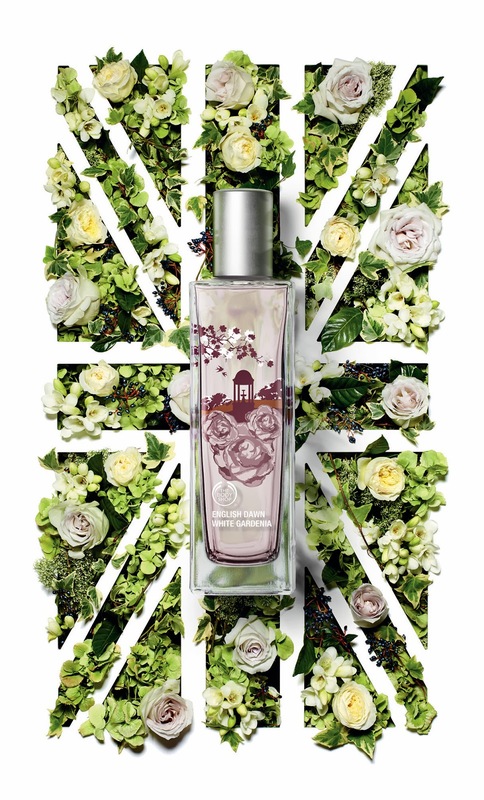 The Body Shop’s English Dawn White Gardenia is available in Limited Edition Eau de Toilette (50ml for £15) and Fragrance Mist (100ml for £7.50). A matching shower gel and body lotion are also available. Samples, notes and quotes via The Body Shop. Image 1 via poshfashionnews.com. Image 2 via madamafigaro.gr. Posted in Feminine, Floral, Perfume Reviews, The Body Shop and tagged English Dawn White Gardenia, Feminine, Floral, Gardenia, Perfume Review, The Body Shop, Voyage Fragrance Collection. Bookmark the permalink. I totally agree that if a perfume doesn’t represent something promised in it’s name it can really put you off. Even if it’s half decent you still feel kind of let down or misled. Exactly. It’s a semi-decent white floral for the price in a lovely bottle so I really shouldn’t complain too much! I think that most of their products are designed with the idea that they are going to be soaps and lotions and not really stand alone perfumes. While we might like the darker aspects of gardenia my guess is the general public still tends to want the fresh, clean, and soapy stuff. This doesn’t sound that bad if you go into it thinking it will be an enjoyable floral and not necessarily true gardenia. One man’s gardenia is another man’s tuberose. Is that the saying? I sometimes wonder what other people smell when sniffing perfumes. I’ve smelled gardenia scents that people said were wonderful and they were if they were lily of the valley. Lol. I think that you make a very fair point, Poodle. At this price point and place in the market, EDWG was never going to be a true gardenia and to expect as much is perhaps not appropriate. That said, it could have been much fuller and more lush. It would be far too mild mannered for you, my dear. i will give you EL Private Collection Gardenia Tuberose has a well crafted gardenia scent… but i could not remove it from my body for TWO DAYS!! (yes, i showered.) this was very very disturbing to me. i scrubbed, rubbing alcohol-ed, i will admit to using Comet to try to scrub the thing away (it was only on my wrist)… once it penetrated my skin it refused to give up. while i suppose some people would imagine this money well spent, i could only imagine what noxious chemicals were now swimming around in my bloodstream. having said that… all Body Shop scents seem to have a base which i suppose they think is musk or sandalwood but smell exactly like Play-Dough or clay. they are fun.. but i am not a 12 year old girl. and having said THAT… i would MUCH rather smell them than the celebuscents as you mention. Gosh! I always find PCTG to be on the quiet side but I do have a very skewed idea of volume when it comes to perfume – I like ’em nuclear. I definitely agree that I’d much rather encounter TBS scents in the wild than celebuscents.